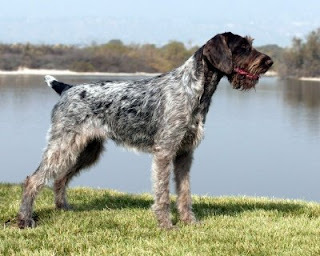 The German Wirehaired Pointer was made in Germany during the 19th century for hunting purposes. It is a result of cross of griffon, Deutsch Stitchelhaar, Deutsch Kurzhaar, and the hunting Pudelpointer. This medium sized breed has a balanced body and webbed feet which help them in swimming. They are an excellent breed of hunting dogs who can work in any weather and areas; showing the characteristics of pointer, retriever, and spaniel.